Living Classroom - THE BENTO PEOPLE BY WHAT'S COOKING DOC? Engines of Health @ The Bento People is a collaboration between Engines of Health and The Bento People, creating a living classroom for people to explore and experience healthier eating options. Dr Chan Tat Hon - 'What's Cooking Doc? ', our Founder and Chef, is also the Medical Director and Principal Trainer at Engines of Health, a company that conducts workshops, seminars and programmes to help participants jumpstart healthier eating habits to combat diabetes, cardiovascular diseases and other lifestyle-related diseases. 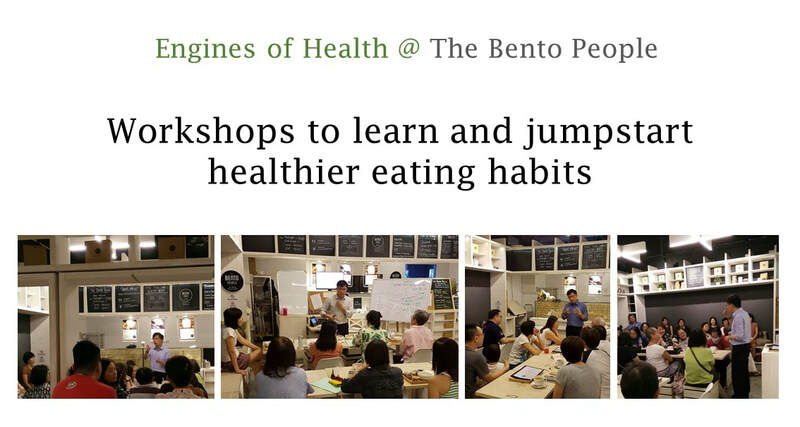 Doc and Health Coaches from Engines of Health can frequently interact with customers at The Bento People during lunch and dinner services, advocating healthy eating and encouraging customers to explore healthier eating options. - A workshop for everyone, not just people with diabetes. to practise choosing the right healthful proportions of grains vs vegetables vs meats. from our 'Make Your Own Healthy Bento' menu. on our 'Make Your Healthy Bento' menu such as Zoodles (spiralised zucchini), Doodles (spiralised daikon), Broodles (spiralised broccoli) and experience that they can be just as delectable as flour-made pastas/noodles.